Not surprisingly, after a day of spicy food and late night drinking our ensuite was not having a very good time the next day. We (including Sacha - learning to scab free stuff from the best) managed to RACE down to breakfast, with only 10 minutes to spare, piled our plates up as high as they would go (I got three plates) and refuelled ready for another fun filled day in Chiang Mai. After a little admin - buying our train ticket to Bangkok - we were at Chiang Mai University hiring bikes to cycle up to Wat-U-Mong (we were only going because of the name of the place really). The ride was a lot of fun, probably more fun than the Wat itself. 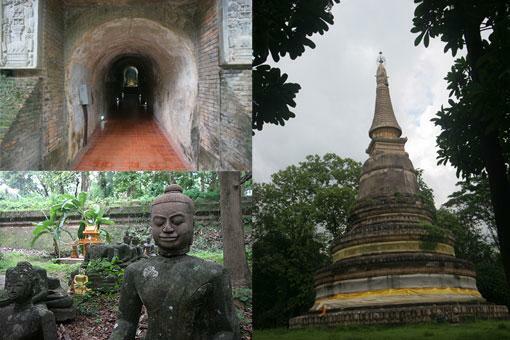 There were lots of underground tunnels, chanting, monks chatting and great sculptures but to be honest I was probably more excited about getting back on the bike and making my way through the insane Chiang Mai traffic. The rest of the day was very uneventful. We had pizza for dinner (which was disgusting and made me feel a little queasy) and then we had an early night after bidding Sacha a fond farewell. 4.There is NEVER any toilet paper in the toilets (unless you pay a lot in a swanky hotel) and if you do use any you cannot flush it - this means every toilet is accompanied by a rather full and unpleasant looking/smelling bin. 5.They have never heard of the Highway Code. People run red lights, go at whatever speed they like, stop whenever the fancy takes them - they even over take and cut up police cars! 6.All monks are happy - fact. 7.They are not big pudding people - this is the only thing which upsets me about the menu - apart from that probably my favourite food. 9.Ladyboys and prostitution are accepted as part of the culture and not a taboo - even though lady boys have to go to their own toilet and pay different prices to everyone else. No one thinks it odd. 11.They love to apologise profusely at the smallest things. I am constantly feeling guilty about something. All in all - I love Thailand.